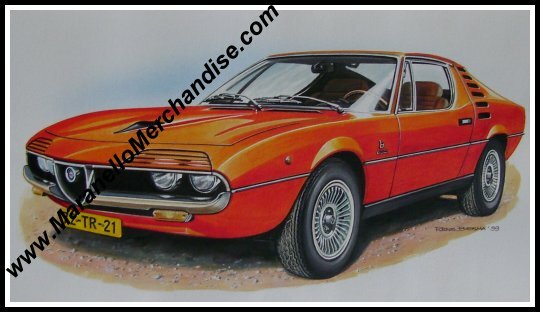 1999 Rens Biesma gouache of Alfa Romeo Montreal. Rens made this gouache for use in the magazine of the Dutch AROC (SCARB) "The Klaverblaadje". Rens is an internationally renowned automotive artist who has worked for many magazines, often drawing / painting "scoops" when no photographic material was available. This particular gouache is in mint condition and made on heavy stock which measures some 50 x 37 cm (some 20 x 14 inches) while the actual drawing is some 27 x 20 cm (10.5 x 8 inches).